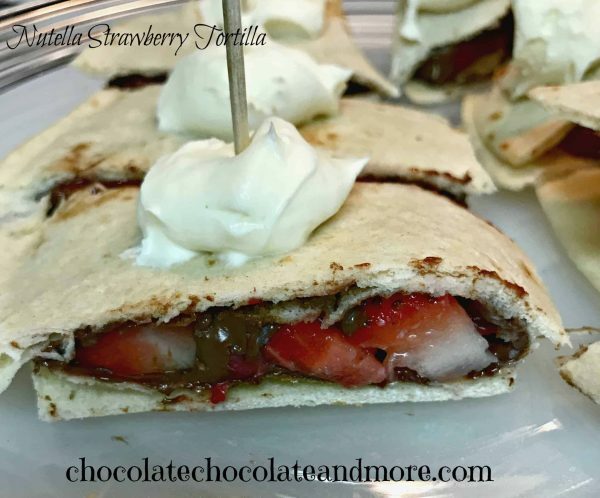 Nutella Strawberry Tortilla - Chocolate Chocolate and More! 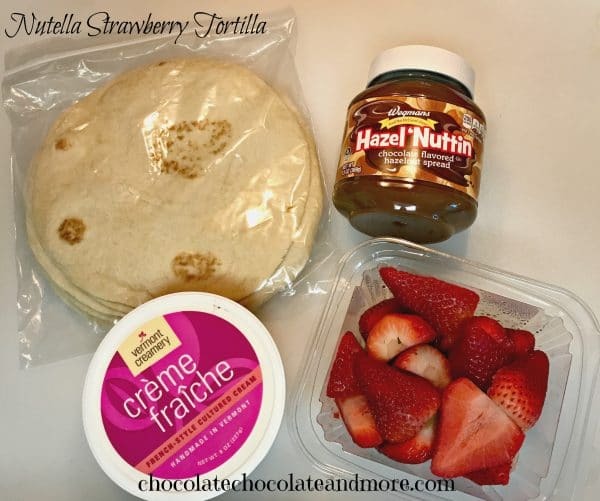 This sweet nutella and strawberry tortilla recipe came to me thanks to a visit to my local grocery store a last weekend. With only four ingredients and no baking needed, you can whip this up as a sweet afternoon snack, a picnic treat, or a last minute dessert offering in five minutes or less. If you’ve ever gone to a grocery store on a holiday weekend, you have probably come across more than a few men and women offering samples of some item that they are wanting to sell you. Usually it is some kind of cheese or cooked item from the freezer section they want you to take home and feed to your family. But this past weekend was Mother’s Day weekend, and the offerings included chocolate and strawberries. One of the sampling stations including fresh made tortillas, so I was expecting something like quesadillas as I walked up. Imagine my surprise when I saw containers of hazelnut spread, a quart of strawberries, and some tortillas laid out. 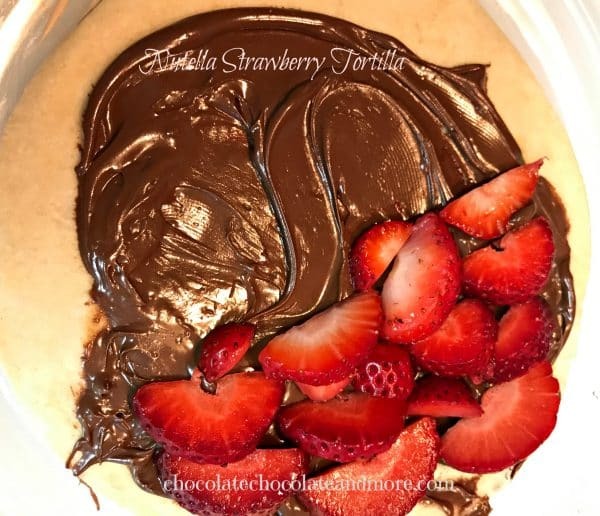 This recipe requires all of four items: soft tortillas, a chocolate or hazelnut spread, fresh strawberries, and a little creme fraiche. The tools you will need are a cutting board, a pizza cutter, and a knife. Take the soft tortilla and spread a layer of the chocolate or hazelnut spread across the top. Layer some sliced strawberries on top of the spread, and fold in half. Use the pizza cutter to slice into four pieces, lay them on a plate, and top with a dollop of the creme fraiche (or whipped cream, or another strawberry, or even ice cream!). You can mix this up by adding bananas, apples, or other fruit to or in place of the strawberries. This recipe is as easy as making a sandwich! Take one soft tortilla and cover in nutella or hazelnut spread. Layer sliced strawberries on half of the tortilla and fold over. Slice into four pieces and top with creme fraiche or whipped cream. It's just that easy! THANK YOU FOR POSTING THIS RECIPE. I LOVE ALL THE INGREDIENTS. IT SOUNDS EASY ENOUGH FOR ME TO MAKE. THANK YOU AGAIN. I hope you enjoyed it! Thanks so much for visiting! Oh dear ! I really enjoy your works ! Thank you so much !